One member of the cabin crew sustained what is believed to be a broken ankle after the plane hit turbulence on its way to Dublin Airport last night. 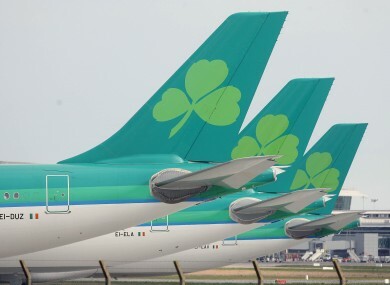 FOUR AER LINGUS cabin crew were hospitalised in Dublin last night, one with what is understood to be a broken ankle, after turbulence on a flight from Milan. The Irish airline has said that it is conducting an investigation into an incident on board the flight from Milan which landed at Dublin Airport just before 10pm last night. A number of ambulances attended the scene with all four of the cabin crew hospitalised as a precaution, one of whom sustained what is believed to be a broken ankle. Although the exact nature of the incident is not exactly clear it is believed that the plane hit turbulence on its return from the Italian city. The Aer Lingus 320 aircraft, which was being flown by two pilots, was carrying 62 passengers, none of whom were injured. A spokesperson for Aer Lingus told TheJournal.ie this afternoon: “We can confirm that there was an incident on board the flight Aer Lingus EI 437 en route from Milan to Dublin where a cabin crew member was injured. Email “Aer Lingus cabin crew hospitalised after turbulence on flight from Milan ”. Feedback on “Aer Lingus cabin crew hospitalised after turbulence on flight from Milan ”.